Dear Father. While The RCIA (Relativised Christianity In America) racket is a crucial part of we Catholics trying to close the Ministries Gap with the Protestants, it should be observed that if one calls the local Pastor, he can sometimes arrange for a conversion process entirely free from the light-a-candle-and-smile meetings. The convert can even use the Penny Catechism if he so desires; and, if he does, he will likely know more about the truths of the Faith than those who run the RCIA Ministry. Yes, it is true; some Pastors really do enjoy leading a convert to the entirety of Truth. I had a friend who entered the Church during college. She asked me to be her sponsor. After I lambasted the RCIA director one evening for saying that some people deserved to have Christ die for them, it was revealed that there was a little old lady in the parish who had seen my friend at Mass and so wanted to be her sponsor, so would I mind terribly if she took over? It was so very thoughtful of the RCIA people to accommodate parishioners' desire to serve like that. It should be emphasized that according to the Rite of Christian Initiation of Adults, baptized, believing Christians should never under any circumstances participate in RCIA or undergo a parallel process. Such Christians should never be received into full communion at a liturgy in which non-Christians are receiving the sacraments of initiation in order to avoid the appearance of regarding Christians as pagans or regarding believers as unbelievers, according to the Rite. According to the Rite, such believing Christians need an individualized, brief period of formation and may be received in full communion at any Mass during the year or to avoid the appearance of triumphalism may be received privately. I did the RCIA thing over the 07/08 year and was too disappointed in the level of the content. It wasn't wrong per se, but it wasn't the kind of information I needed. I had already read myself into the Church through sites like fisheaters.com and needed something different than what was provided. I just didn't have the gumption then to express that. What was the rationale behind needing an RCIA? Was it revolutionaries behind the council who thought that there would be such a desire for people to flood the Church that a simple pastor couldn't handle each and every case himself? Was it just because a longer catechumanate process was "old" and therefore to be desired? Gil Garza: this is, of course, completely true. And it is also, in practice, completely ignored in almost all parishes. I was one of the many, many converts* who suffered through RCIA. Our parish priest, a very orthodox and kindly man, left most of the instruction in the hands of a couple of lay people: one, a retired head teacher of a Catholic primary school, was a devout feminist, and we had a number of run-ins (should that be 'runs-in'?). The one I recall most vividly was a discussion on suffering, where Mary (the former HT)told us that there was no point in suffering. I quoted Colossians 1:24, and tried, somewhat inarticulately, to explain the Catholic attitude which St Paul was expressing: that our sufferings, united with the Cross, are actually fruitful. Mary's reaction: "Oh, we don't bother with that old woman-hater Paul!" *Our then bishop (who, laus Deo, has now retired and been replaced by the courageous and noble Bishop Egan) didn't like the term 'converts' and used 'New Catholics'. That works for a year or so, but after that, we're not really 'new'. We're still converts, though! What sort of man is it who wants to avoid being thought of as having the putative malady of Triumphalism rather than being grateful he was born into the Triumphant Church? Far be it from ABS to not think of his own self as belonging to the Triumphant One True Holy Roman Catholic and Apostolic Church. My Church can beat-up your crummy christian communion any day of the week and twice on Sundays Has always been one of our Family's Motto. The other one, the one that is of more consequence today is It is always darkest before the storm and that is so owing to the number of Cradle Catholics who, sadly ascended into authoritative positions and who deny that The One True Holy Roman Catholic and Apostolic Church is the only true Church that not only can but must pass judgement on the uncountable false religions. My wife availed herself of the end run around a formal catechetical process by working directly with a local priest friend, for which we both remain very grateful. "I'm okay with everything except maybe these two things." "Okay, try thinking about them like this, and read this, and pray about it." While formal catechesis prior to entering full communion can be helpful, I'm afraid the bureaucratic (or Procrustean, delightful) elements of RCIA (or similar programs) do put off a number of people. I admire anyone, who for intellectual reasons, converts to Catholicism. As Newman said 'to be deep in history is to cease to be a Protestant'. Other reasons for conversion (respect for liturgical tradition, or the simple fact that they were marrying a Catholic) no longer apply, nor have they for half a century. There is little about the present-day Catholic Church which would be attractive to outsiders. Simply saying that the present-day Anglican Church is arguably worse does not cut the mustard. In my limited experience, RCIA is where the real parish shows itself. Scrutinies ? They're a bother and it's too late to start. Already confirmed in another denomination but most recently agnostic - we'll reconfirm. It'll be meaningful this time. Got someone in mind for your sponsor - well, we've already asked the woman who speaks in tongues to be yours (and her husband is in the legislature !). "Do you have to say anything during the ceremony ? Don't worry about that. It's nothing but a few words." 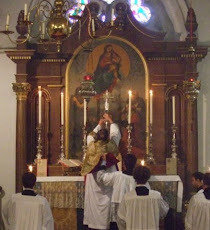 (that evoked a gasp when a missal was finally located.. "I believe and profess all? all ?". This from the already confirmed, who then learned that there is a Catechism. The poor person with the tongued sponsor who needed the full works - "Saturday night is HOW long ?".) Not to mention the Good Friday surprise, when the newbies were naively sitting in front (as the congregation proper had filled up the rear) and the cross appeared and they were on the side that starts... "We're doing what now ?" Or the person who was sent to Confession and could only mutter "I've never done this before and I don't think I've done anything horribly wrong" - only to find out that there about a year later that there are actually examinations of conscience. Showing up for morning Mass only to be told that 4 parishioners isn't enough to make doing it worthwhile. LOH - no one says that any more. Transubstantiation - "we're supposed to think it's become meat and gristle?" -to which the obvious reply reply should have been "It's Jesus, dear - no gristle. "instead of silence. Post Easter mystagogy - "no, the instructors are all tired of these meetings." But worst of all, learning about sexual behavior from the priest, using himself as an example. Sigh. . I think God created guardian angels as spirit so that they can't tear their hair out or beat up their people as the case may call for. It would have been so much easier under Frank. "According to the Rite, such believing Christians need an individualized, brief period of formation and may be received in full communion at any Mass during the year or to avoid the appearance of triumphalism may be received privately." Point taken, but in my opinion triumphalism is hardly the Catholic disease of this age. We suffer much more from a steadfast refusal to proclaim the beauty, greatness and sacredness of the Catholic faith. RCIA is a fruitless wasteland. More a trial to be endured than anything positive. The really annoying part, for me, is that the RCIA is described as being the model for all liturgies and our Christian life, yet it is easily the most contrived part of the contrived new liturgical books, and that they trashed the ancient liturgies which developed around the catechumenate in the ancient Roman church. Sure, we don't necessarily have the interrogations, scrutinies, etc. but the lections and prayers are directed towards coming to new life in baptism in the most beautiful way. They are paired perfectly with the liturgy of the paschal vigil. Mystagogy and the centrality of baptism have never been the same since I sang the prophecy from Exodus, of the crossing of the Red Sea, and then saw the candle leading the procession, which is so obviously the column of fire at the Red Sea.